There’s always a point during a long overseas holiday where you start to miss home. Though you are having the most remarkable, relaxing time, there’s a point where you start to miss things like the comfort of your own bed, all your personal belongings and luxuries and people who speak the same language as you. Once you get back home, you naturally miss the long lazy days doing whatever you please in the most beautiful place. But at the same time, you happily settle into the familiarity of your surroundings. You are back in your own home and you can finally sleep in your own bed. You are surrounded by all the things you treasure. But with Petres it was different. Hotel Petres is a small family-owned hotel situated on the Greek island of Paros. It is positioned right outside the main town called Naoussa, and very close to the beach! Like most of the blue and white buildings on the island, it is surrounded by wide open spaces of vegetation. We went to Paros during their peak summer season which is during August. It is hot but there is a constant sea breeze which is very welcoming in the heat! Before we arrived at the hotel, we had traveled a bit around Greece and Paros and we have travelled all around the world, so I can confidently say that Petres is different. It is a hotel like no other, in the best kind of way! My whole experience of visiting Greece, namely the breathtaking island of Paros, was deeply influenced by my stay at Petres Hotel. Walking into Petres for the first time was like walking into someone’s home. The kind of home that seems new and old all at the same time. It seems brand new because everything is so fresh and perfectly clean. But at the same time it seems old, as if the owners have been collecting beautiful, deeply personal items for years, to freely showcase to all who visit. Petres is in fact 23 years old and one quickly notices the time and effort that has been put into this hotel over the years. The natural decor of the hotel has the perfect balance between modern and ancient Greece. Let me tell you about the beauty of Paros. Picture this: You wake up and go down to breakfast anytime between 9 and 11:30. But maybe you step outside onto your balcony first, to admire the sea view. You walk into the beautiful, homely kitchen and choose what you want from the homemade Greek buffet breakfast (which by the way is the largest variety of breakfast foods I have ever experienced) You then enjoy your breakfast outside under the grapevine covered patio. Before long, one of the owners, Clea, will stroll out to welcome all the guests. “Kalimera, Bonjour, Good morning!” She stops by each table to chat to each guest, usually in their home language. She makes sure they are okay, makes them laugh and clears out their empty plates. She turns everyone into a morning person. Her husband, Sotiris, is just as welcoming. When he is not walking around checking up on the hotel, he is sitting at the reception, ready to tend to your needs, give you advice or drive you down to the nearby town, Naoussa. After breakfast you can go up to your room which would have been cleaned while you were downstairs enjoying your breakfast! Now you are ready to enjoy the day. It is best to rent a car, scooter or quad bike or you can make use of the shuttle service to Naoussa. Petres has plenty of parking available right outside the rooms. The most beautiful and popular beach in Paros, Kolymbithres, is just a few minutes drive from the hotel and there are a some amazing restaurants on the way. Of course, the main centre of Naoussa also has numerous restaurants, bars and boutiques right on the water’s edge. We visited Paros mainly because the Kitesurfing is so good, so everyday we would drive our scooter to the Kite beach, Pounta, which was a very pleasant 15km drive along the coast. 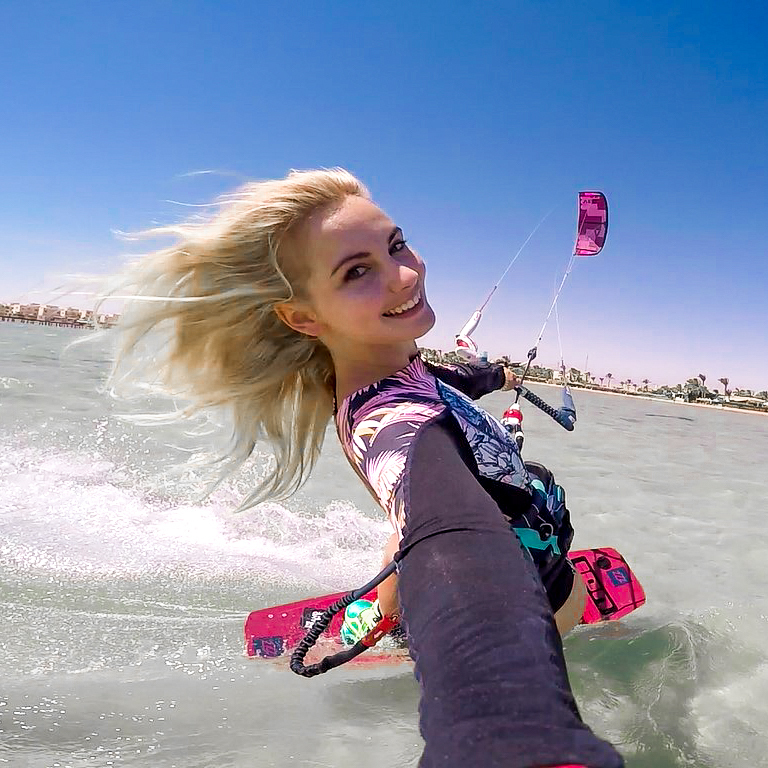 So if you are a Kitesurfer, Windsurfer or are interested in learning, then I would highly recommend Petres since you will still be close to the most beautiful beaches, restaurants and shopping areas. But that is IF you can drag yourself away from the hotel! If it wasn’t for the Kitesurfing, I could have easily spent the day just relaxing by the gorgeous turquoise blue pool. The hotel also has an amazing tennis court, indoor gym and pool bar. You can also order snacks and salads from the kitchen. One thing that really stood out for me about this hotel was the attention to detail. One can clearly see the effort that has been put into every little detail from the decor to the food to the rooms. Our room was one of the 1st floor rooms, with a balcony facing the pool and sea. It has everything you need in a hotel room: TV, WiFi, safe, coffee/tea making facilities, mini fridge, dressing table, cupboard space, swimming pool towels, etc. The bed is luxuriously comfortable and there is plenty of bedding. One thing I particularly loved about the room is that it has an aircon AND a fan. Perfect for the summer heat! Of course the balcony with a table and chairs is also a highlight. Homemade Greek food made from only the freshest ingredients, enchanting sea views and family style hospitality are what makes this white and blue Hotel Petres an authentic Greek experience. After all the good food, friendly faces and sunshine still lingering on your tanned skin, you will leave there feeling like a spoilt Greek God or Goddess! This is the best of Paros, the best of Greece! This is one place where you will be sad to leave! At the end of your stay, Sotiris will kindly drive you to the airport or port free of charge. He has a big van, so all your luggage will definitely fit in! Hospitality is a gift, and it is a one that Sotiris and Clea have been given in abundance and share freely with whomever crosses their path. Book your stay at Hotel Petres! Make a reservavtion on their website (www.petres.gr) or e-mail them @ info@petres.gr. They will be happy to give you all the information you need and book you spot in one of their beautiful rooms.